Douglas presents new premium store concept Douglas PRO in Hamburg. Douglas, one of the leading beauty retailers in Europe, presented its new store concept Douglas PRO and openened a pilot store yesterday in the Eppendorf district of Hamburg. With Douglas PRO, Douglas is elevating its product assortment to an entirely new level and combining the topics of beauty and health. The innovative concept stands for beauty from the inside and outside, offering customers a combination of highly effective skin care and individual beauty treatments, plus dermatological food supplements, which are available at Douglas for the first time. In line with the #FORWARDBEAUTY strategy this new approach is a continuation of Douglas’ investments to develop its stores into points of experience. The topics of beauty and health are becoming more and more intertwined. Trend monitoring has revealed a great need for highly effective skin care and holistic beauty care. With Douglas PRO, Douglas is fulfilling these customer needs and creating a new hot spot for beauty with the philosophy of enhancing beauty from both the inside and outside. The product assortment, which has a clear focus on high-quality international skin care products, is complemented for the first time by dermatological food supplements to boost the effect of creams and serums from the inside. “With Douglas PRO, we are realising our approach of experiencing beauty holistically through personal advice, beauty treatments and a unique product range. I’m delighted that we are able to offer selected brands in our PRO store that are making their very first appearance on the German market,” says Tina Müller, CEO of Douglas. The PRO store’s product assortment comprises innovations from the medical beauty field which are based on top skin care expertise – known as “Dr. brands”. These products are developed by dermatologists in line with the latest scientific knowledge. Examples include the Swiss brand viliv by Dr. Felix Bertram, which is characterized by a high concentration of active ingredients and individual combinability, and the brand Dr. Barbara Sturm, which was developed by the internationally renowned Düsseldorf specialist for innovative skin care and anti-aging treatments. Customers can also look forward to the Dr. med. Susanne von Schmiedeberg skin care range, which will be available online from November 2018 and in stores from January 2019. Another skin care range to make its début in Germany is KORA Organics by the Australian model Miranda Kerr, who is also a successful global influencer thanks to 23 million followers on her social media channels. The range of certified organic and natural products in this line detoxifies, nourishes and revitalises the skin. In addition, Douglas PRO offers a premium portfolio of skin expert brands such as La Mer, dermatologica and MBR as well as popular lab beauty brands like The Ordinary, Grown Alchemist and Dr. Perricone. The offer is rounded out by selected pharmacy cosmetics. At the store’s opening in September 2018, Douglas is also introducing the new category of beauty food, including brands from well-known manufacturers like Ogaenics as well as brands that have only just been launched, such as #INNERBEAUTY. With these food supplements in the form of pills, powders or drinks, consumers ingest hyaluronic acid, collagen and special nutrients for firm skin and stronger hair. High-quality make-up products and niche perfumes complete the portfolio. Furthermore, Douglas PRO places even greater importance on service and expert advice in the store, employing qualified specialists who can provide personalised skin care solutions. The store also offers a special treatment room for exclusive beauty and skin care treatments as well as skin analyses using state-of-the-art technologies. With its selected product assortment and special service offers, Douglas PRO is aimed at customers who value a well-groomed appearance and want to emphasise their personal beauty. The innovative skin care systems of different brands address both traditional target groups and fans of niche brands and skin care novelties from the United States. Douglas PRO also offers a broad selection of care products for men’s skin. 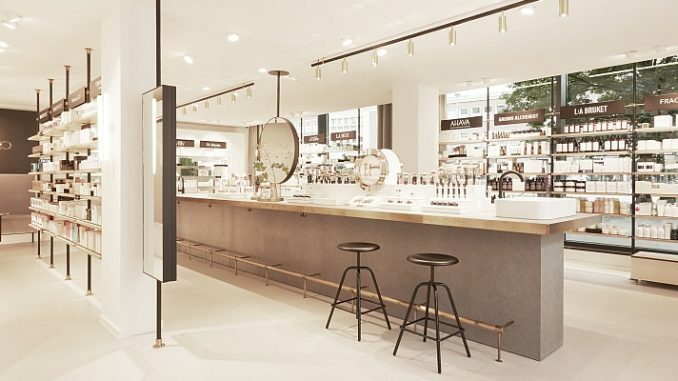 The store’s look reflects the modern orientation of the new beauty concept, taking up the latest standards and combining a minimalist design language with “hygge” elements that ensure a cosy atmosphere. Warm natural materials such as maritime pine meet high-quality brass and soft velvet in elegant grey. The understated interior design promises a sensation of calm and well-being, and the look of the store is soothing to all senses.